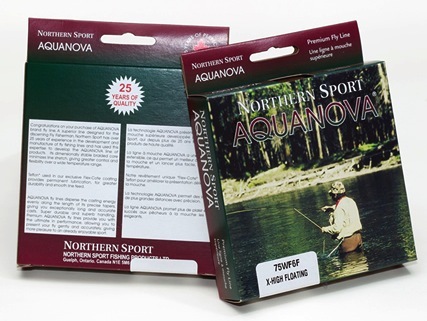 Northern Sport's Aquanova fly line offers anglers the highest level of features and performance expected of a premium line—minus the premium price. The Aquanova series of high performance lines evolved from Northern Sport's years of experience and knowledge of the fly fishing sport. These fly fishing lines are manufactured using high quality material to cover every fishing situation—from the smallest pond, to the pounding surf. Aquanova has a dimensionally stable braided core that minimizes line stretch, giving greater control and flexibility over a wide temperature range. The Teflon used in our exclusive Flex-Cote coating provides permanent lubrication, for greater durability and smooth line feed. Aquanova fly line disperses the casting energy evenly along the length of its precise tapers, allowing exceptionally long and accurate casts. Premium Aquanova fly line is super durable and offers superb handling. By allowing anglers to present the fly gently and accurately, Aquanova offers the ultimate in fly line performance, giving more pleasure to an already enjoyable sport.